Friday I gave the kids a slide show on craters and explained how they come in different sizes, but they’re almost always nice and circular because when the object hits the surface it blows out material (ejecta) in ALL directions, no matter the shape of the object. We also discussed how you can tell some are older than others, and what might be under the surface – the ejecta blanket around the crater looks like mud flows, rather than the nice rays you get from an impact on a dry surface. Then the kids went out and dropped rocks into trays filled with flour to make craters of their own. I used disposable foil trays, put a few inches of cheap flour in the bottom and then sprinkle cornmeal or chocolate drink mix powder on top so when the eject is blown out of the crater its easy to see with the contrasting colors. The kids dropped rocks from different heights (giving the rock a different impact velocity) and compared the size of the craters. They also looked at how crater size depended on the size of the rock. Then it quickly became a free for all with rocks and flour everywhere, which is why this activity is done OUTSIDE! I couldn’t believe I forgot to take movies of the impacts because that’s kind of coolest part, so here’s a slow motion movie of this lab that we took a few years ago. The second activity we did involved making a volcano with baking soda and vinegar, but instead of starting with clay all around the cup before the first ‘eruption’, we built up the clay as we went. Every time we had an eruption we put down a different layer of clay where the vinegar and baking soda mixture flowed over the cup (I cut down a medicine cup). In this way we slowly built up a nice shield volcano. Here’s a picture showing the first two layers, black and red. And after many eruptions, and lots of playdoh we ended up with the following. The blue straw bits were used for taking core samples of the volcano and was a bit hit with the kids. I explained how scientists trying to studying a volcano can’t sit there for hundreds of years and watch where the lava flows but they can take core samples to look at the different layers that built up over time… of course they won’t be brightly colored like ours. I had done the crater activity many times before but the Universe at Your Fingertips DVD has it laid out for you in their Activity C-16, What Craters Can Tell Us About a Planet. And the volcano activity is C-15, Making and Mapping a Volcano. I saw a post on Facebook about giving a child a new book each day in December and thought what a great idea! My kids are too old for this and only read ebooks on their iPads but I started thinking about some of our favorite picture books from when they were younger. Parts, and it sequels by Tedd Arnold is a hysterical look at a young kid who thinks he’s falling apart when he notices his hair on his comb, is it all falling out! and belly button lint – his stuffing is coming out! The writing is great, very similar to Dr. Seuss with its rhythm and rhyme, which makes it fun to read aloud. The next book is one my kids and I still make jokes about and quote, though I’m sure no one around us ever understand why we’re saying, “I have a jar. Do you have a jar?” The book is called The Happy Hocky Family moves to the Country by Lane Smith. It was a gift from grandma for my eldest’s 4th birthday and it was an instant hit. The Hocky family moves from the city to live in the country and the book shows the problems they have adapting to country life with some very simple pictures and very brief statements that hit the funny bone just right. This book has been on our shelf for over 11 years and there it will remain. If Everybody Did by Jo Ann Stover is another book we read over and over and over again. The illustrations are the key to this book about what would happen if everybody… picked flowers (a whole meadow of empty stalks), smashed cups (room full of broken cups) etc. I can’t find my copy of the book, I think I may have given it to a friend, or stashed it with the Dr. Seuss books. Its a funny way to get the point across to kids why they shouldn’t pick flowers, or leave toys about, squish the cat, etc. The negative sign is there because if you stretch a spring (positive x), it will pull back, wanting to return to its relaxed position, so the vector F is in the negative direction. The spring exerts a force on the mass hanging off it, but the mass exerts an equal and opposite force on the spring and we can measure that force, its just the weight of the masses and hangar. Luckily for us, those are labeled so we just have to read numbers off the masses as we pile them on. Each group picked a spring and measured how far it stretched (x) as they exerted a known force on it by hanging known masses on the end. By clipping a large bulldog clip on to the end of a meter stick, you can hang it off a ring stand as shown in the photo. I bought a cheap set of springs for this lab that have nice red indicators that the students used to measure the distance. Students made a table in their lab books to record the mass, m, in grams since thats what they are marked as, then a column for mass in kg, the Force exerted by the mass on the spring is just the F of gravity, F = mg, where g is 9.8 m/s2, exerted on the spring by the hanging mass, m, and the distance the spring stretched, x (meters). When they were done taking the data, they made a graph of Force, F, versus distance, x. Most of them used their iPads to make the graph and do a linear fit of the slope, which gives them the spring constant, k. This graph is of the force exerted on the spring, hence the positive slope. To show the force exerted by the spring on the masses, it would be basically the same graph but the F values would be negative and the slope would be negative. We just wanted the slope of the graph so either graph would suffice. They also preformed the experiment with a rubber band to see if it obeys Hooke’s law. The graph of F vs x for the rubber band was not nearly as linear as the spring data and some found that a quadratic fit the data better than a line. We ran out of time in class but I sent the students an email link to a video by Destin from SmarterEveryDay on youtube, where he talks about rubber bands in relation to sling shots. I came across this video from an article on wired.com, Do Rubber Bands Act like Springs? Rhett Allain, the author, basically does the same experiments we did, but he also had a force sensor that let him take data while the rubber band was moving. Go check it out! I found a good documentary from BBC on Netflix for plate tectonics, so we started class by watching the first 30 minutes of the Volcano episode of Earth: Power of the Planet. It can also be found on youtube. I also showed the Alfred Wegener vs The Fixists (Continental Drift) Science History Rap Battle done by a 6th grade class from San Jose. I didn’t show this one in class, but its another nice video on Pangea and plate tectonics. 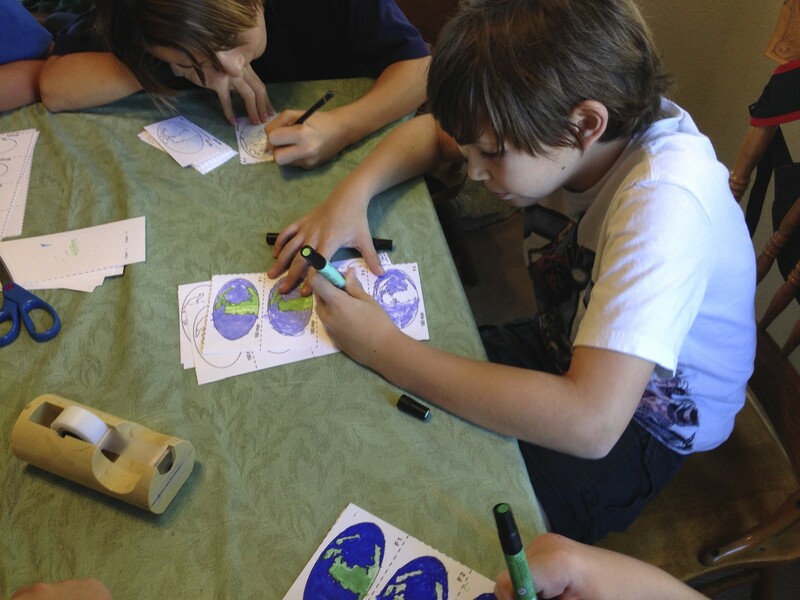 After the movies the students spent the next hour coloring in a flip book that when finished, shows the continents moving from Pangea to their present day location. They also cut out the continents to form puzzle pieces and put them together to form Pangea by looking at the fossil evidence and their shapes. Both of these activities I found online. The flip book can be found on Purdue’s website and is called “Voyage through Time: A Plate Tectonics Flipbook”. A simpler version of the continent puzzle can be found on the USGS website but searching a little more I found this link, A Plate Tectonic Puzzle – American Museum of Natural History, that is a more complete puzzle. I was a bit worried they would revolt about the coloring the flip book- my hand hurt when I did the whole thing – but they sat around the table talking about everything under the sun… you know socializing! while they colored. There are a number of different labs you can do to show conservation of energy but I decided to keep it simple and just use a pendulum. Before we started the lab, I lectured a bit about energy, explaining the difference between kinetic energy (energy of motion) and potential energy. We talked about roller coasters and how the cart’s energy is all potential energy at the top of the first hill before it starts accelerating down the slope and at the lowest point all that energy (ignoring frictional losses) has been transferred to kinetic energy. The Physics Classroom has some nice examples and explanations for conservation of energy, including an interactive roller coaster where you can design the hills and ramps and then let the cart go, while it shows you the kinetic energy, KE and potential energy, PE. For the lab, the students used the Video Physics app to take a movie of the pendulum swinging through at least one full oscillation. The movie below shows the red marks the student put on the ball in each frame of the movie. The meter stick in the background is used to give the app scale and the origin is set by the students so that the lowest point of the pendulum is (x=0,y=0). You can see the pendulum starts with zero velocity and at its highest point, so all its energy is potential energy but as it swings through the lowest point, its potential energy goes to zero as its kinetic energy reaches its maximum. The Video Physics app doesn’t let you do much with the data so the students open their data in the Graphical Analysis app also by Vernier, which is what produced the graph below – this is data from a different group than the movie above. In the data above, the red data points are the x-position of the pendulum, and the blue data points represent the velocity of the pendulum in the x-direction (along the horizontal). You can see that when the pendulum went through the origin (x=0) at t=1s, the velocity was negative and at its maximum, therefore KE was also at its maximum. When the pendulum reaches the turning point at t=1.4s, the velocity goes to zero and then becomes positive as it reverses direction. Students made graphs for motion in the y-direction as well and were able to read off maximum height (y) and maximum velocity (in the x-direction) for the pendulum from the data tables. They then used those numbers to calculate the maximum KE = 1/2 m v2 and maximum PE = mgy. The students found that their values for the maximum kinetic energy were very close, if not the same as their maximum potential energy, demonstrating the conservation of energy. The Physics Class room has a nice animation for pendulums and conservation of energy.